Much more Reliable as compared to TUNEL assays – No False positive signals. Readout – Flow cytometry, 96 well plate reader, Fluorescence microscope. Ease Of Use: Results in less than 60 minutes. 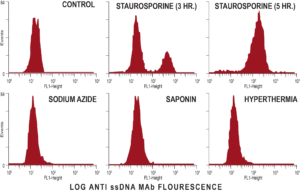 No need to run DNA ladder assays to detect DNA damage in cells. Cell Technology introduces Apo ssDNA, an antibody based assay to detect DNA damage (single stranded DNA: ssDNA) in Apoptotic Cells. Fig (A). MAb to ssDNA staining of apoptotic but not of necrotic cells. 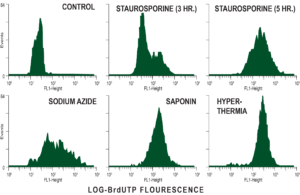 Fluorescence distributions of MDA-468 cells heated in formamide and stained with MAb F7-26 were generated on a flow cytometer. Apoptosis was induced by staurosporine and necrosis was induced by sodium azide, saponin, or hyperthermia. Note that apoptotic cells are intensely stained with the MAb, whereas the fluorescence profiles of necrotic and control cells are similar. Fig (B). TUNEL staining of apoptotic and necrotic cells. Fluorescence distributions of MDA-468 cells stained with TUNEL were generated on a flow cytometer. Apoptosis was induced by staurosporine and necrosis was induced by sodium azide, saponin, or hyperthermia. Note that cells at early stage of apoptosis (staurosporine 3 hr) are weakly stained, whereas late apoptotic cells (staurosporine 5 hr) and necrotic cells are intensely stained by TUNEL 12. Ohno M, Takemura G, Ohno A, Misao J, Hayakawa Y, Minatogu-chi S, Fujiwara T, Fujiwara H (1998) "Apoptotic" myocytes infarct area in rabbit hearts may be oncotic myocytes with DNA fragmentation: analysis by immunogold electron microscopy combined with in situ nick end-labeling. Circulation 98:1422–1430. Zamzani N, Kroemer J (1999) Condensed matter in cell death. Nature 401:127–128. Allera C, Lazzarini G, Patrone E, Alberti I, Barboro P, Sanna P, Melchiori, A, Parodi S, Balbi C (1997) Condensation of chromatin in apoptotic thymocytes shows a specific structural change. J. Biol Chem 272:10817–10822. Frankfurt OS (1990) Decreased DNA stability in cells treated with alkylating agents. Exp Cell Res 191:181–185. Frankfurt OS, Robb JA, Sugarbaker EV, Villa L (1996) Monoclonal antibody to single-stranded DNA is a specific and sensitive cellular marker of apoptosis. Exp Cell Res 226:387–397. Frankfurt OS (1994) Detection of apoptosis in leukemic and breast cancer cells with monoclonal antibody to single-stranded DNA. Anticancer Res 14:1861–1870.